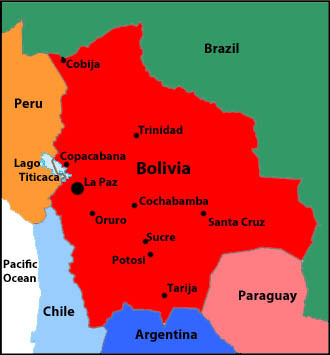 Bolivia, considered by some as the heart and soul of South America is located in central South America. Bolivia is landlocked and surrounded by its neighbors of Brazil to the east and north, to the southeast lies Paraguay, to the south Argentina and to the west Chile and Peru. Bolivia being in the center of South America has a wide and varying landscape. To the west lie three magnificent mountain ranges forming the backbone of the Andes. In the far western part of the country is Cordillera Occidental, a mountain range made up of mostly dormant volcanoes, moving eastward the Cordillera Central mountain range rise, and farther east rise the spectacular snow capped Cordillera Occidental mountain range of stunning granite peaks. Placed in the middle of these great mountain ranges is the Altiplano, a large flat expanse of land with an average altitude of 12,000 ft. To the north of the Altiplano is the world’s highest navigable waterway, Lake Titicaca at an astounding 12,507 feet. The southern portion of Altiplano gives way to Sal de Uyuni, the largest of a series of dried lake beds and salt flats. Lake Poopo, salty, and varying on rainfall is the largest inland lake. La Paz, the administrative capital of Bolivia is located in the Altiplano region, at an elevation of 11,900; La Paz is the world’s highest capital. More than half of the Bolivian population lives in the Altiplano region. The eastern slopes of the Cordillera Oriental mountain range give way to gentler mountains and hills through the Cochabamba area to the flat grass plains of Santa Cruz. To the northeast the mountains give way to valleys and rivers leading to the more humid and tropical areas of the Amazon basin. Most of Bolivia’s major rivers are found in this northeastern section of the country. A few being the Beni, Madre de Dios and Mamore Rivers. Bolivia, with its varying landscape see’s a great difference in climate as one crosses the country. Freezing temperatures from the snow covered peaks of the Andes, Nevado Sajama being the highest at a astounding 21,463 feet to temperatures in the mid 50’s in the Altiplano and La Paz areas, to the hot, humid and rainy eastern lowlands. Bolivia, one of the poorest countries in the Americas, has a rich history, once being part of the great Inca Empire till the Spaniards arrived in the 16th century and wiped out the Inca population. With the help of Simon Bolivar, the country won its independence from Spain in 1825. In the War of the Pacific, 1879-1884, Bolivia lost its only outlet to the Pacific Ocean to Chile. In the 1965 the Bolivian government with the help of the United States was able to fend off a guerrilla movement by Che the Cuban revolutionary. Bolivia has a total population of just over 9 million people, being the largest indigenous country in the Americas with more than 50% of the population being of Quechua and Aymara speaking Amerindian. Mestizo, mixed Amerindian and Europeans as well as whites make up the remainder of the population. 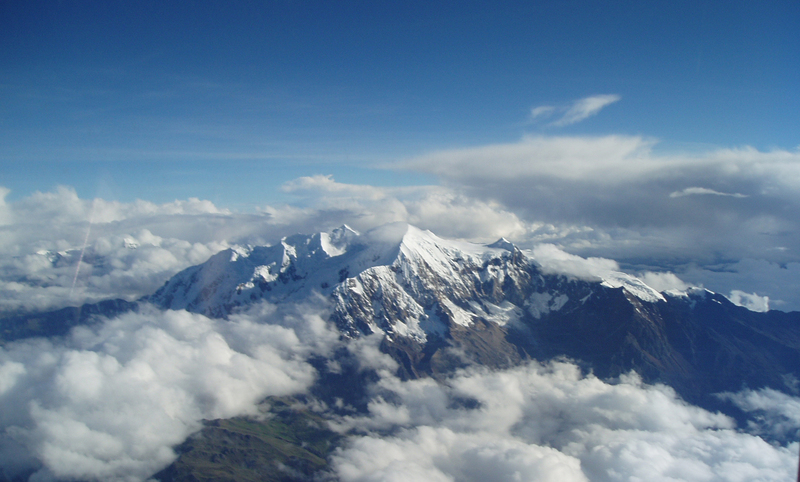 Bolivia not only with its vast great natural landscape is also rich in natural resources. Natural gas, gold and silver to name a few. Thinking of heading to Bolivia? Santa Cruz Viru Viru International Airport is the largest airport in Bolivia. El Alto International Airport in La Paz ranks as the 2nd highest in the Worlds Highest Commercial Airports and is South America’s Highest Commercial Airport.